Tim was transplanted 3 days before our wedding anniversary on July 8, 2016! He looks incredible. His sense of humor is back, his hearing is improved and he is walking 30-35 minutes a day on the treadmill. Thank you and may God bless you for your support and prayers. We were very happy to learn that Tim is cancer free! We are managing the side effects of his disease and are truly grateful for every day we have together. Today Tim and I found out he has liver cancer. Our doctor assured Tim that this is a common consequence of cirrhosis. Nonetheless – we were truly dismayed. Tim’s biggest concern, of course, was for his ability to be a father for Isabella.I know as the mom- that Tim is the best Dad ever and that even if he does pass before she turns 18- that Izzy will be blessed by his love. Those of you that know us- please email, call and visit with good things. We are scared – but mostly we just are really grateful for what we have. I need some help. My husband Tim is dying. Tim is only 47 years old. Tim was diagnosed in 1989 with autoimmune hepatitis, which has caused his liver to fail. You know what it means to love someone and I am appealing to that love. Our family is in need. Tim is a loving husband, we have been married for 7 precious years. Our son Ryan is twelve years old, and our daughter Izzy was born only nineteen months ago. We have already exhausted our personal savings during a medical emergency trip to Florida, and have taken out a home equity loan. I am selling my wedding ring. The last two years have brought a rapid decline in Tim’s health and he has been told that his only chance of survival is to have a liver transplant. In order to keep Tim alive we need to quickly raise a minimum of $10,000 for the cost of staying withing 20 minutes of the Mayo Hospital for six months after the transplant. This is the estimated time it will take for Tim to recover and our insurance does not cover this very hefty cost. I am reaching out to 100 of my family and friends asking you to consider making a $100 dollar donation for Tim’s life. I know for some of you it may seem like a lot, but how do you put a price on the life of a young man with a beautiful wife and two children? To help with this financial burden, a fundraising campaign in Tim’s honor has been established with HelpHOPELive, a nonprofit organization that has been assisting the transplant community for nearly 30 years. 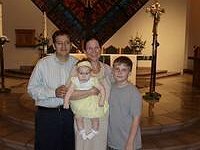 All donations are tax-deductible, are held by HelpHOPELive in the Southwest Liver Transplant Fund, and are administered by HelpHOPELive for transplant-related expenses only.above our family’s picture. I know by the grace of God that we will raise the funds needed to keep Tim alive to see his son become an Eagle Scout and to walk his daughter down the aisle upon her wedding day. PS: If you believe you have friends or family that could help reach a wider circle, please ask them forward this letter to their contacts. Please see a recent article featuring Tim in the Northwest Explorer. Thank you to the entire parish family of St. Elizabeth Ann Seton, The Knights of Columbus, The over 50 club, the St. Vincent De Paul, the 7AM, 9AM, 1PM, 5PM, and 7PM choirs, Boyscout Troop 209, the congregation of Casas Church, the community of the Casas Kid City Preschool, The parish ofo St. Marks, The Parish of St. Odelia’s the congregation of Faith Community church, our amazing family including Droegemiers, Arntz, Chavez, Lawson, and a network of frinds including the Pictons, Giovaninis, Gomez, Jimenez, Gutierrez, Silva, Casey, Asarez, Calvelli, Kisers, Hutchinsons and the amazing student council of Ironwood Ridge High School along with the National Honor Society, the connect Four Club, the Culinary Arts program and the incredible outreach of so many beautiful families in our community. We are so humbled and so grateful. We hope the campaign will continue with a silent auction in the near future. God bless you all and please pray for hope, love and charity in our tiny family. On July 7, 2016 Tim received his liver transplant! It was five years in the making- but worth every second. His skin is healing, his muscles are coming back, and best of al, that funny witty, clever and brilliant man I married is back! Thank you. If you donated a prayer, money, or your time, we are so grateful. God bless you. Thank you Lori, Cyd, Jacki, Sam, Charlie, Lindsey and Linda. I am more grateful than I could ever say. Your family remains in my thoughts day-to-day. I like Tim so much, I truly hope things turn around for him soon. Dear Theresa, It was a pleasure to be partners in the Graduation ceremony. There was this especial light that came from you. Now, I understand. The loving hand of God over your head causes you to radiate so much joy. Blessings and prayers for you and your family. Hi Timothy, We donated $100 after reading your article in Explorer. My hubby, George and I cried while reading it and had to do something. Praying for a miracle for you either by God's divine hand alone or through his working with a transplant. God be with you as you fight this battle. I pray they will begin the transplant process even before the total amount is reached. I have only known the Chavezs family for a few months, but they have already taken a HUGE piece of my heart. I love them so much and and see everyday the wonders of Christ in this familys life. They encourage me daily to love everyone due to the way they love all who eneter their lives. I have never meet a family like this. I love them so much! Please, please help this wonderful man and (family) so that he may live and watch his wonderful family grow up. They have changed my life, so please, help Tim to stay around so that he may continue to help others. I love you guys. The Ironwood Ridge Student Government kiddos will do their best to help raise money and awareness!! We are thinking of you and your family and wish nothing but the best! We believe in the strength of prayer and miracles! Praying to all the angels and saints in heaven for your amazing family. Friends in Christ through the Holy Order of the Knights of Columbus. God Bless you.